What is the Value of Knowledge™ approach? Where did it come from? How does it help us? As early as the 1960s, leading management thinkers recognized the essential and growing role of knowledge in our economy and society. Economist Fritz Machlup and “godfather of management” Peter Drucker were among the First Knowledge Wave to document this trend. Now, over a half-century later, we take it for granted. That represented a great leap forward. However, while these pioneers gave us grand visions, insights, and theories, they left us with little in the way of tools to implement them in the modern enterprise. “Knowledge” languished for three decades until a Second Knowledge Wave came along in the 1990s — Nonaka and Takeushi, Davenport and Prusak, Thomas Stewart, and others. Knowledge into the enterprise in the form of “knowledge management” (KM). The knowledge ball moved down the field — it was a heady, exciting vision. But knowledge still did not fully take root in the workday world. Knowledge initiatives, often designed without clear ROI goals, continued to be subject to the hazards of the business cycle. In good times, knowledge was tried out; in hard times, it was scaled back — often brutally, as in the recessions of 2000 and 2008. Knowledge as an enterprise resource was not yet sustainable. 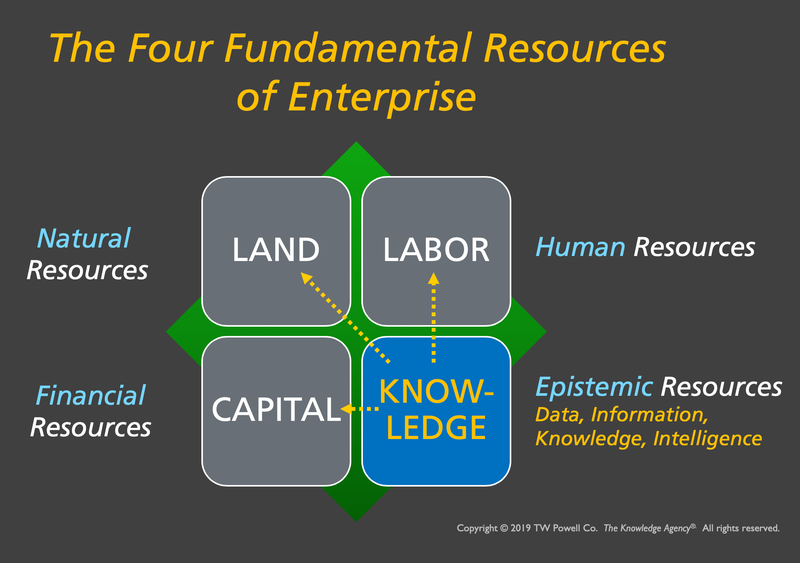 Sustainable knowledge — the current Third Knowledge Wave — derives from one core insight: That knowledge, like any other resource (for example, plant and equipment, raw materials, people, and capital) carries with it both Benefits and Costs. In other words, knowledge is an investment — not just an overhead expense. The ROI of knowledge can be measured and managed, just as it is with investments in tangible enterprise resources. I have spent much of my career rendering operational the grand insights that those giants before me left behind. My mission is to translate their “big, hairy, audacious” ideas into initiatives that organizations can use — to solve their problems, to serve their clients and stakeholders, and to improve their performance and results. My mantra is “making knowledge work”. To this end, my team has built a portfolio of assessment tools, models, lenses, and frameworks collectively called the Value of Knowledge™. These tools have now been prototyped, built, and deployed. Starting in 1996, I have (1) developed training materials for both corporate and academic consumers, (2) presented these frameworks and tools to executives worldwide, and (3) most importantly, used them in live client engagements in a range of industries. The earliest of these tools was the Knowledge Value Chain®, still our flagship, and now joined by other tools as mentioned elsewhere on this site. My journey has taught me that knowledge is the most valuable enterprise resource — yet, paradoxically, it is also the most misunderstood and most randomly managed. The good news is that (1) there are huge gains to be reaped from improvements, even small ones, and that (2) there now exist industrial-strength tools to achieve such gains. Does my experience resonate with yours? If so, ping me and let’s start a dialogue. I would definitely gain from that, and I suspect you would too.